CALL US AT 801-532-0777 OR GO ONLINE TO MAKE YOUR RESERVATIONS NOW. 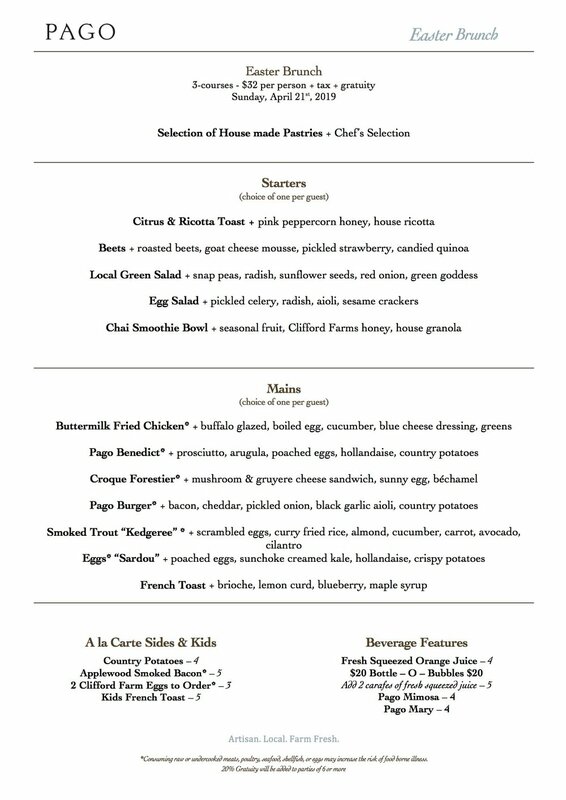 This Easter, Chef Phelix Gardner and his team have created an exceptional Three-Course Easter Brunch at Pago using seasonal, farm fresh products across the menu. The menu starts with a selection of house made pastries for the table, your choice of appetizer, and your choice of main. Kids a la carte menu also available. Our intimate space fills up quickly, so make your reservations now 801-532-0777. Sign up with your email address to receive news and updates from our restaurant group: Pago, Finca, East Liberty Tap House, Hub & Spoke Diner and Trestle Tavern. We respect your privacy and will not share or sell your information to any third parties. We are part of the Pago Restaurant Group - bringing unique food and beverage-focused restaurants to the neighborhoods of Salt Lake City, with from-scratch menus using high quality, locally sourced ingredients.